Although geographers are historically known as people who make maps, map making is actually the field of study of cartography, a subset of geography. Geographers do not study only the details of the natural environment or human society, but they also study the reciprocal relationship between these two. For example, they study how the natural environment contributes to human society and how human society affects the natural environment. 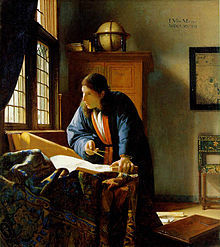 The paintings by Johannes Vermeer titled The Geographer and The Astronomer are both thought to represent the growing influence and rise in prominence of scientific enquiry in Europe at the time of their painting in 1668–69. ^ "geography (n.)" (Web article). Online Etymology Dictionary. Douglas Harper. n.d. Retrieved 10 October 2018. ^ "Geography Education @". Nationalgeographic.com. 2008-10-24. Archived from the original on 2010-02-07. Retrieved 2013-07-16. Steven Seegel. Map Men: Transnational Lives and Deaths of Geographers in the Making of East Central Europe. University of Chicago Press, 2018. ISBN 978-0-226-43849-8.